Click above for video from 7News; click here for an article from the Daily Mail. And we have a winner! 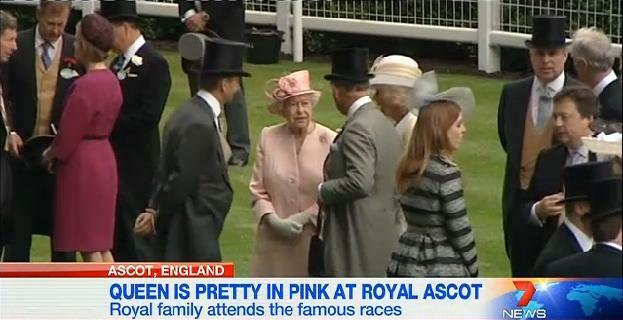 As requested by commenter Katharine Naomi on our Ascot flashback, the Queen wore the Rose Gold Brooch. 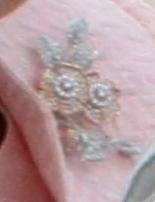 We haven't seen it on this color before (looks pink to me, though peach was the official description), and it certainly complements the colors of gold that seem to be present in this mystery brooch. Many of you asked for a hat shape variation. Well, we didn't get that, but we did get some design variation: this is not an Angela Kelly original but an ensemble from two of the other designers that serve Her Maj, a Stewart Parvin coat and dress and a hat by Rachel Trevor-Morgan. You like?